The Strandbeest began as an art project of Dutch artist Theo Jansen in the 1980s. Today, amateur Strandbeest enthusiasts are building their own walking beasts and putting some unique spins on the idea of a wind- or gravity-propelled walking sculpture. I-Wei Huang, an artist and tinkerer, has come up with what might be the cutest version yet: a hamster-propelled Strandbeest. 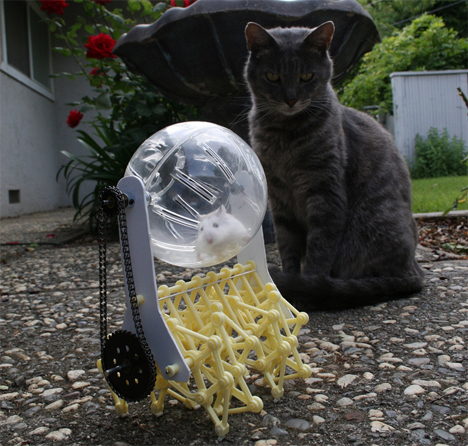 After receiving a mini Strandbeest kit from Gakken Magazine, Huang set out to create a unique propulsion system for the little plastic critter. He though about steam, but realizing that plastic and steam don’t exactly get along well, he scrapped that idea for a far more adorable one. 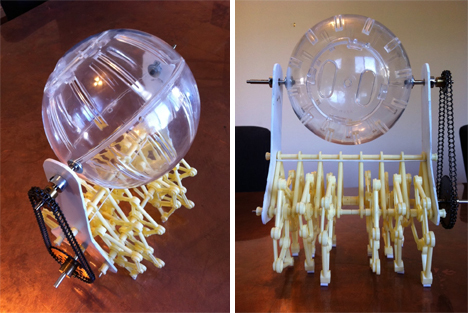 Huang modified the small Strandbeest to include a hamster ball on top. He hoped that, as the hamster ran inside the ball, its weight and movement would be strong enough to propel the machine along. 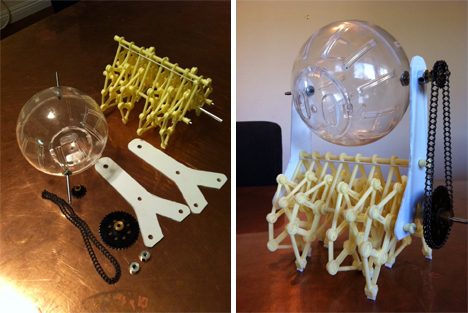 He added some cogs and a chain that would activate the Strandbeest’s legs and move it forward with the hamster’s movement. The artist didn’t have a pet hamster himself and wasn’t interested in keeping one as a pet, so he borrowed a hamster named Princess to test drive his contraption. It clearly worked very well, and it made for an oddly beautiful vision: a tiny animal running quickly while the mecha-legs below seemed to creep along slowly. In any case, Princess the hamster got to feel large and powerful for a few minutes while running right past a seemingly disinterested cat. See more in Art Vehicles or under Transportation. April, 2014.